Wednesday, January 4, 2017 6:00 PM Wayland High School AWAY 18 Zeeland West High School HOME 57 Meet Recap Wayland went 0-2 on the night falling to both OK Gold front runner TK and a very Solid Zeeland West. Elliott Andersen and Tyler Sikkema each had two pins for the Wildcats. Congratulations to Mason Miller and Zach Westfahl for qualifying for the MHSAA Division 2 Individual Wrestling Regionals! 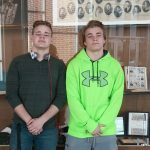 Mason and Zach will compete Saturday, February 20th at Byron Center HS at 9:30 AM.